Posted on September 26, 2018 at 12:56 am. The cold season will start wreaking havoc across Irving, TX very soon, causing great stress to public commuters and professionals who travel every day. The sad thing is that the problems brought on by the frosty days do not only end on the road. Inside every house, homeowners also deal with freezing and bursting pipes as the temperature gets too low. 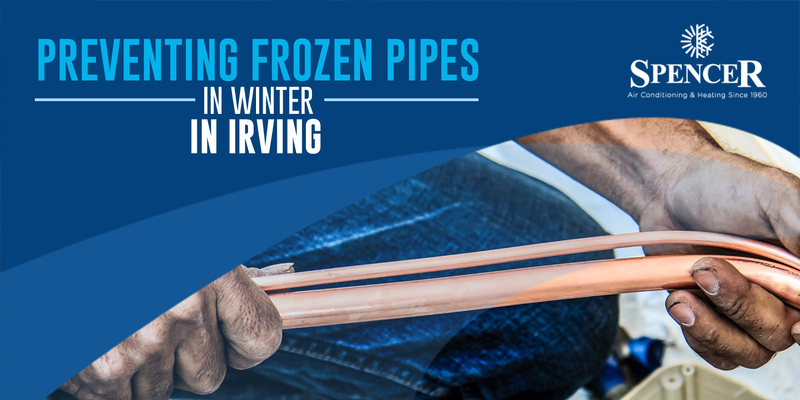 Here’s what you need to know about the precautions you can take to prevent frozen pipes in your Irving, TX home. What Will Happen If Your Pipe Freezes? To understand why the frozen pipes break and then lead to costly water damage to your property, you need first to understand what happens to the water in your pipe. The water will expand when it freezes, which can cause a significant amount of pressure to the pipeline. As the pressure grows, splitting, cracking, or bursting can happen no matter how sturdy the pipe is. Which Pipes Are At Great Risk of Freezing? Pipes that are exposed to excessive cold are facing a great risk of freezing. This includes swimming pool supply lines or sprinklers, outdoor hose bibs, and other pipes situated in the unheated areas like garages, basements, and attics. Also, indoor pipes that are connected to exterior walls can become a subject to freezing during the extreme cold. How to Prevent Freezing Pipes? Open the cabinet doors to give way for the heat to get into the non-insulated pipes. This is best for pipes that are found under your appliances and sinks near the exterior walls. Allow warm water to drip overnight. Sometimes all you need is a consistent trickle of hot water to keep your pipes from freezing. Have a consistent temperature setting in your thermostat both day and night. You might habitually turn down the heat at night when you sleep, but consistent drops in temperature can catch you off guard, which in return can freeze your pipes. If your pipes freeze, do not panic! Turn on your faucets and if no water comes out, leave them on and contact the professionals. Do not thaw your frozen pipe with open flames. For burst pipes, turn off your main shutoff valve and leave your faucets on. Call the professionals to get immediate assistance. Frozen pipe problems should not be ignored. With adequate preparation, you can prevent costly problems from happening and protect your home from major damages in the future. Spencer Air Conditioning & Heating is here to offer assistance when you have frozen pipe issues.